The Ellen Finley Earhart Department of Nursing at Park University offers program options in Kansas City, including a BSN pre-licensure program option and a RN-to-BSN program option. Our flexible scheduling, dedicated faculty and relationships with hospitals and medical facilities throughout Kansas City provide current and future nurses with valuable opportunities to achieve their educational goals. 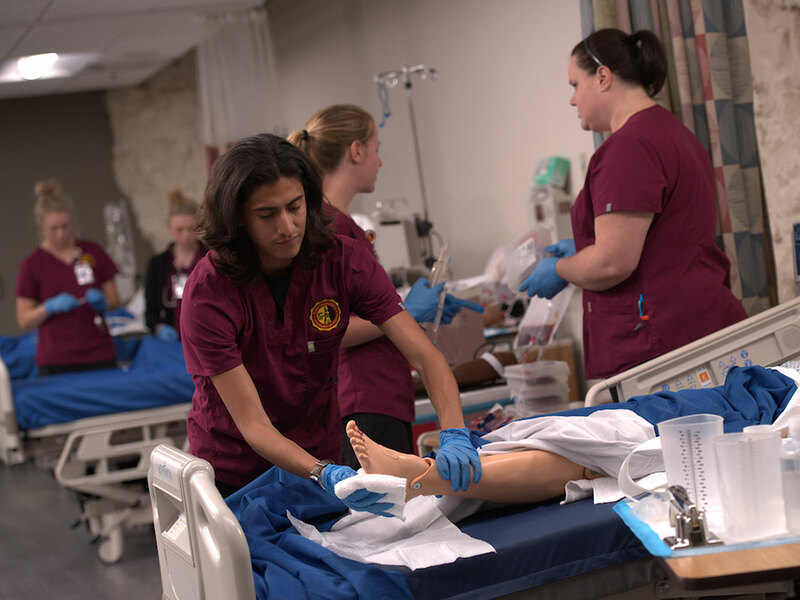 Park University’s BSN program combines the “art and science” of nursing with a foundation in the liberal arts to prepare graduates who will assume the scope of practice expected of the professional nurse. The Nursing pre-licensure program option is designed for the non-nurse or Licensed Practical Nurse who desires a baccalaureate degree in nursing. It is a face-to-face and online program taught in Parkville, Missouri. Enjoy the benefits of one-on-one instruction with small class sizes and a state-of-the-art skills labs only a short drive outside of downtown Kansas City at our main Parkville campus. Park University’s online RN to BSN degree program option allows Registered Nurses to complete the requirements of a Bachelor of Science degree in Nursing with Park University. This online program offers flexibility and is perfect for students who wish to complete the program either full-time or on a part-time basis. Students have a maximum of 5 years to complete the program. In 2016, the School for Behavioral and Health Sciences and the Department of Social Work was configured within the newly created College of Education and Health Professions. This change reflected the growing attention to “Behavioral Health” (SAMHSA, 2016) and the projected demand for expanded behavioral health (formerly “mental health”) professionals trained to intervene efficiently and effectively in issues such as mental illness, substance use, homelessness, domestic violence, post-traumatic stress disorder (especially in work with active and returning service members), and a wide range of other challenges to the goal of wellness and social well-being for all people. In February, 2016, the Master of Social Work (MSW) program earned full initial unconditional accreditation through the Council on Social Work Education (CSWE). The MSW curriculum at Park University was identified by the CSWE as one of the few programs in the country with an advanced social work practice concentration in Behavioral Health. Other disciplines, such as Nursing, Psychology, Sociology, and Criminal Justice was also impacted by changes in policy and practice that are being fueled by goals, funding, and research/grant opportunities being made available through the Center for Mental Health Services and SAMHSA. The CRTIBH serves Park students, human service and behavioral health programs in the greater Kansas City region and beyond. The Center serves to attract high quality faculty, students and community training partners to Park University. The Center will work directly with the Behavioral Sciences Regulatory Boards in Kansas and Missouri and the office of Continuing Education at Park University. The Center will work directly with the Behavioral Sciences Regulatory Boards in Kansas and Missouri and the office of Continuing Education at Park University. These bodies review learning objectives and credentials of instructors for all educational programs offered for continuing education credit. The Social Work Program at Park University has gone through the vetting process and is currently an“Approved Provider” for Social Work. RN’s (in KS) – 30 hours of CEU’s every two years. Licensed Professional Counselors (LPC’s) – 40 CEU’s for each renewal cycle. Behavioral Health providers and administrators – as needed. Full time social work faculty members develop materials, learning objectives and evaluation instruments for the initial CEU course offerings. Current workshops for CEU workshops for KS and MO include, “Resolving Ethical Dilemmas,” Responding Effectively to Bullying in the Workplace,” Understanding the changes in the DSM-5,” Trauma-Informed Care,” “Strengths-Based, Person-Centered Interventions,” and several others. An annual survey will be developed to assess what types of training are most needed by administrators and staff. CEU course offerings are marketed to in the greater Kansas City area. A structure has been developed to process and distribute funds that are generated in offering these CEU programs. The Center generates external funding from federal, state, and private foundations to support policy goals and the mission of the Center. The Director collaborates with faculty, community partners, and Park’s Office of Sponsored Programs and Research, to identify and apply for grants designed to assist the center in achieving its mission. We will identify community Behavioral Health partners and submit submit grant proposals. Non-grant funded research will be conducted by faculty and students on issues relevant for evidence informed policy, program development and practice interventions. The results and implications of the research will be disseminated through seminars provided by the Center, as well as conference presentations and professional journal publication. An example of such research is conducting Program Evaluations for Behavioral Health organizations in the community. A research committee will include faculty members from social work, nursing, psychology/sociology and criminal justice. Proposals for research that is supported and possibly subsidized by the Center will be vetted by members of the research committee. Proposals are then reviewed by Park’s Institutional Review Board (IRB). The Chair of the Social Work Department is designated as the Director of the Center. As such, the Director of the Center reports directly to the Dean of the College of Education and Health Professions. This additional administrative duty will be included on the Director’s faculty contract, which indicates the stipend and additional duties, including expectations for the summer. Park University’s education program is approved by the Missouri Department of Elementary and Secondary Education. Graduates of the School of Education are prepared for all school environments through diverse placements in rural, suburban, urban and international settings.